At Santee's Cereal our bed and breakfast customers are among our best customers. That's because bed and breakfast guests really do like our famous home made taste. If you own or manage a bed and breakfast, we hope you'll give us a try. We're sure you'll love the reaction you'll see on the faces of your guests as they experience the mouth watering flavors of our cereals. Our Berry Delight granola is a truly sensational delight. While most of our original flavors have just one featured nut or fruit to emphasize, this recipe actually has two. (Some call it our blue berry and strawberry recipe.) We have added fresh whole blue berries that are dried to a raisin like texture along with sliced strawberries. And combined with our special berry flavoring, it has quickly become one of our top sellers. This product is made without gluten containing ingredients! Our reduced fat Cinnamon Applesauce recipe was created to accommodate the many customers asking for a reduced fat cereal. 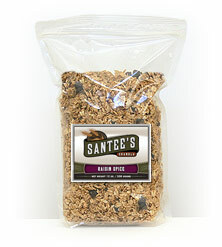 It was in the process of developing a new distinct apple flavor, that we discovered that we could use applesauce for great apple taste and produce a reduced fat granola at the same time. This enabled us to reduce the oil content by half and still have a mouth watering apple flavor. Coconut Crumble, our fourth granola recipe was created with simplicity in mind. Our customers asked for a great tasting granola cereal with no fruit or nuts, so we added some extra coconut and replaced the fruit and nuts with wheat germ. This simple recipe was an instant hit with folks who like it's simpler flavor, or who can't eat fruit or nuts for dietary reasons. Golden Almond, the third granola recipe in our line has become famous in it's own right. It is now the most popular recipe for ice cream and yogurt toppings. By substituting almonds for pecans in our original Vanilla Pecan recipe and adding just enough almond flavoring to give it the perfect almond taste we created a great tasting breakfast cereal...and a wonderful topping too. Our Multi-Grain granola recipe is best described as a wholesome and chewy nutritious combination. 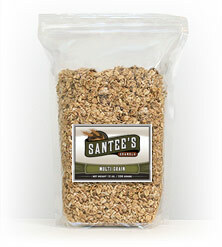 Having a mixture of four different grains along with the added flavor of roasted sunflower seeds, this variety is loaded with flavor in every bite. 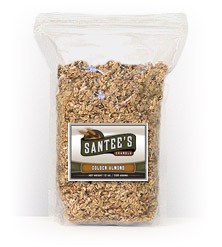 With the rich goodness of barley, rye, wheat and oats, a healthy sense of pure satisfaction can always be enjoyed. Raisin Spice, our second granola recipe gets its spicy fresh taste from just the right amount of cinnamon, combined with fresh raisins. 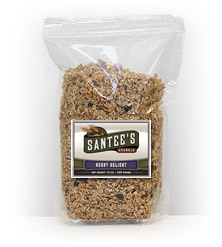 We substituted raisins for nuts...and raisin lovers go nuts over the taste and texture of our Raisin Spice granola. 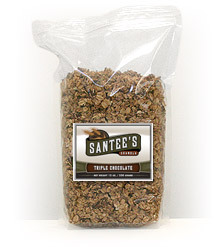 Our Triple Chocolate recipe was developed with one goal and purpose, to cross the barrier of old-mind-sets and mend the extreme gap between tasteless granolas and unhealthy breakfast cereals. By adding a small amount of cocoa powder and crispies along with a few chocolate chips, we have produced a granola breakfast cereal that even kids will love. 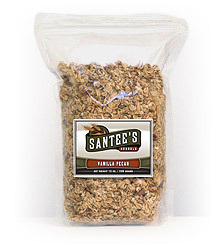 Vanilla Pecan, the original granola and still most popular flavor, is defined by it's unique home made taste. Fresh, finely chopped pecans blended with our special vanilla flavoring create a memorable taste that people ask for by name. 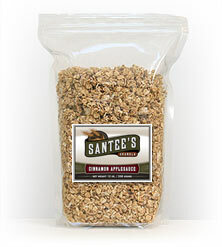 This is the original granola recipe that created Santee's Granola. Add a little cinnamon chunky applesauce and heat and you have a mouth watering apple crisp flavored treat. 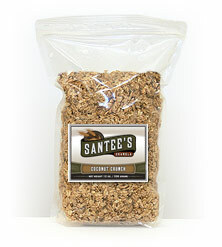 Come back and visit us often, we'll be adding new granola recipes and products on a regular basis. Note: if you want to be notified by email when we introduce new flavors or products please click here. Be sure to include your email address in the body of your message. Returns / Refunds: If there is ever an unsatisfactory situation with our product quality or delivery service, we will always do our best to rectify the situation as best as possible through product reshipment or credit refund.